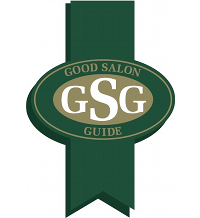 The Good Salon Guide is the only independent, nationwide scheme for assessing professional standards and services within the hairdressing industry. The 2,000+ salons listed in the guide are rated by professionally trained inspectors against a set of criteria, similar to the process undertaken by AA or RAC hotel guides. For salons, the value of the scheme’s membership – which is paid for by monthly subscription – extends beyond the additional promotion and stamp of consumer confidence to include advice and guidance on business issues and access to money saving offers. With 34,000 salons in the UK and Northern Ireland, the Good Salon Guide was in need of an online CRM solution to offer its remote sale teams access to a central customer database of clients and prospect information, and to better manage marketing activities. Previously, the company used a Microsoft Access database that held customer information at head office and sales staff managed their own activities without either central visibility or control. Since the implementation of Workbooks CRM, the Good Salon Guide has seen vast improvements in reporting and evolved its sales incentive model from customer number to customer value. The Workbooks.com online CRM system is now a fundamental part of the day-to-day process for both sales and head office staff, from the creation of a new client file to recording every single interaction with salons. By improving the quality and timeliness of customer information, all Good Salon Guide’s staff can also better engage with customers. Track sales through a four stage process from initial presentation to closure, compared to previously only knowing only if the business had been won or lost. Compare the performance of sales staff and identify problems in the sales process. Offer accurate forecasting and pipeline management. Incentivise sales staff on the value of new business not just sales targets. Focus on detailed customer segmentation to improve marketing campaigns. Exploit the Workbooks API to integrate with the Good Salon Guide website to track the page views of each customer. 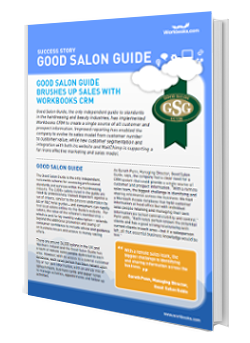 Click the button below to read the full Good Salon Guide case study and find out how an online CRM system from Workbooks can assist your business.